This week I have been teaching my high school students about imagination, appreciation, curiosity and innovation. The joys of alternative education 🙂 During this time, I’ve made some (albeit naive) teacher observations and formulated some theories to help myself improve and better understand what I’m doing. The most valuable lesson so far is this: The classroom is a vantage. From this vantage, we see the world for its order and structure. As Mufasa took Simba to the mountaintop, so do we teachers take our students to the classroom to make sense of the world in which they live. 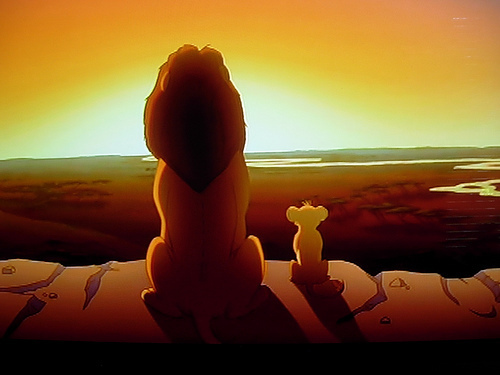 From the vantage of Pride Rock, Mufasa shared with Simba the details of his kingdom: Places to go and places to avoid. At the same time, he is also sharing the weight of the responsibility of the kingdom (which I see as knowledge, adulthood, and the unknown future). In this moment, he is imparting an understanding of life from the mountaintop because that is where the chaos of life begins to make sense. That is the place of perspective. Without the context of perspective we will hardly understand the significance of the information we retain. One important point is that a mountaintop is positioned far away from life on the ground below. That’s not a bad thing! I think the “ivory tower” critique of education sometimes directs us to teach a more “realistic” education. But this is a mistake. Instead of making our education realistic, we believe that education must be detached from reality in order to prepare students for the abstract and unpredictable future. Is the future reality? No. We can only speculate how our students will use the information we teach them and we must give them the ability to make connections on their own. The ability to imagine the future and prepare for its challenges. Imagination + Creativity + Knowledge + Appreciation + Hard Work = Innovation. Hopefully, my students will begin to value the ideas in their minds, appreciate the ideas of others and make connections between the two and reality. Reality is not always the sort of place where people develop the capacity for creativity and imagination. That’s why we have the classroom. The classroom is a vantage. Every other hour of the day is enough reality for now.